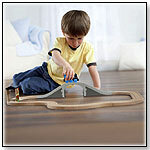 TDmonthly® - New Toys and Games: Thomas & Friends™ Wooden Railway 5-in-1 Up and Around Set from FISHER-PRICE INC. Create up to 5 different layouts with this 20-piece play set. Includes Thomas, 17 pieces of track, a bridge and a tunnel. — Grafton Stein, owner of Toys on the Square in Hummelstown, Pa., told TDmonthly in a May 2013 survey that Thomas the Tank Engine toys are their best-selling licensed products. — In a February 2014 survey, three out of 10 retailers told TDmonthly that Thomas & Friends sets from Fisher-Price were among their best-selling wooden toys. — In a February 2015 survey, Sue Hottel, co-owner of No Kidding (aka Sand Castle Toys Inc) in Mattapoisett, Mass., told TDmonthly that Thomas & Friends trains are her some of her store's best-selling wooden toys.